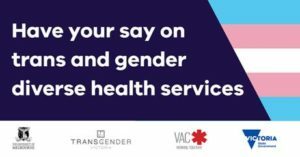 The Department of Health and Human Services and Melbourne University are conducting a survey to better understand the experience of trans and gender diverse people in accessing health and community services. The information will be used to consider ways that the delivery of health services to trans and gender diverse people can be improved. The survey is a partnership between the department, the University of Melbourne, and the Trans Expert Advisory Group of the Victorian LGBTI Taskforce. Supported by Transgender Victoria and VAC. The survey will close on Monday, 28 August.